When Mr. Aitch and I went to visit my brother and sister-in-law in New Hampshire last month, I took along some knitting. We went on the Harley so it had to be small knitting. 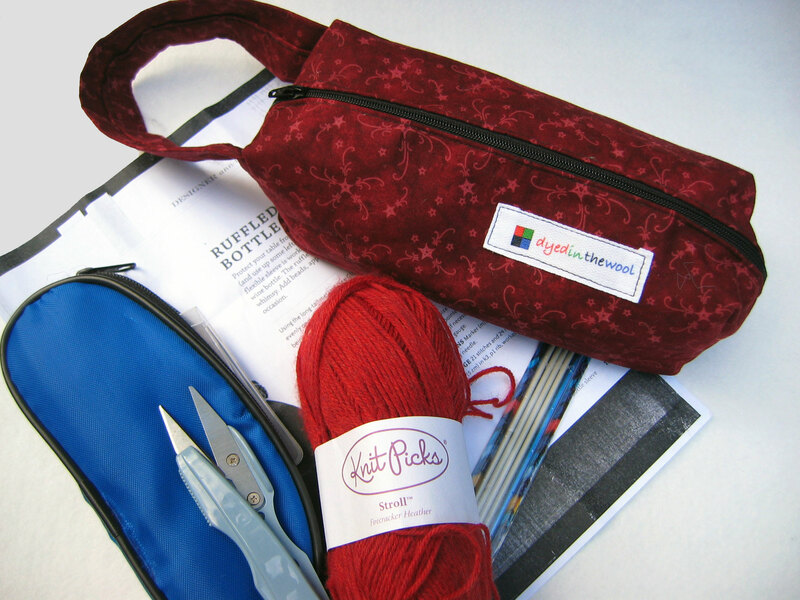 That’s the knitting bag I won from Dyed in the Wool along with a pattern for a wine bottle sleeve, needles, notions bag, and yarn. It all fitted in there quite nicely. 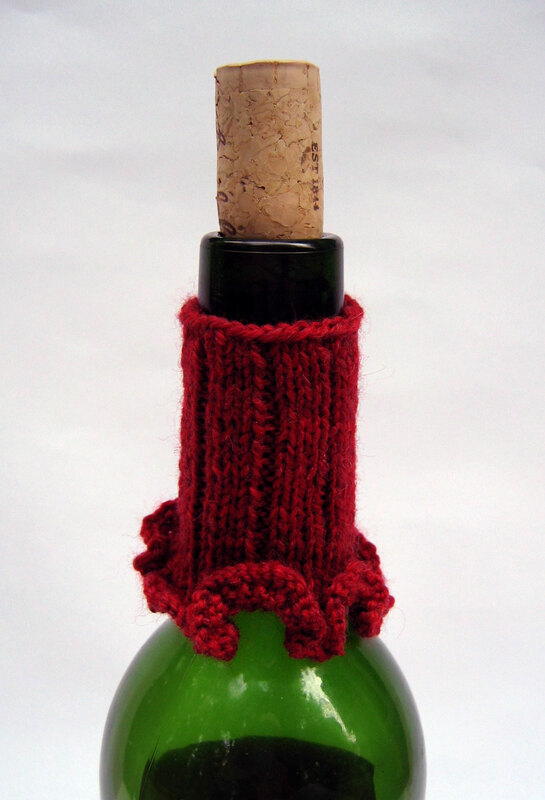 I knitted a wine bottle sleeve for them one evening after dinner. And they actually use it! My sister-in-law’s sister visited them last week and she remarked about how wonderful the wine bottle sleeve was for catching drips. If it was a bit larger around and shorter, it would be perfect to catch the drips on a bottle of olive oil. It actually folds down so it’s got two layers to absorb the drips. Plus it’s larger around. And shorter. 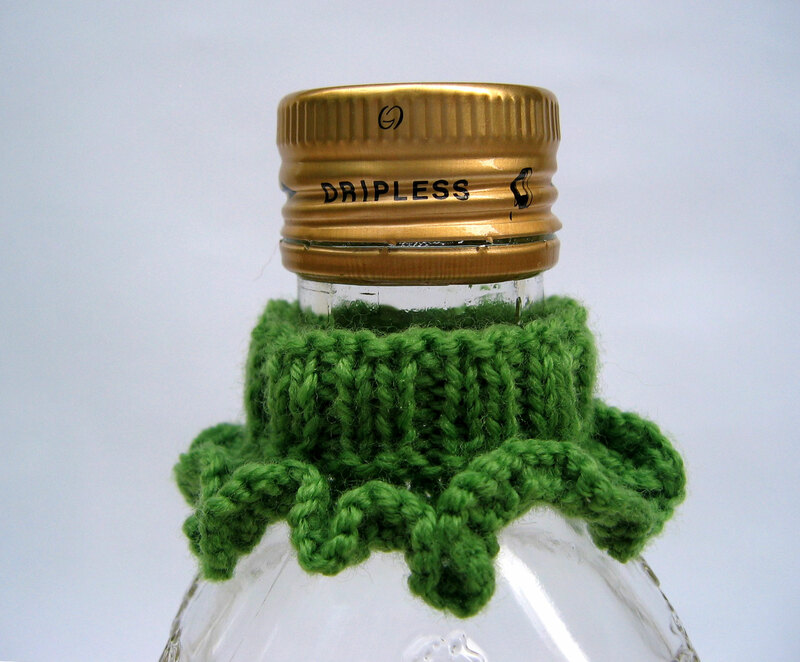 And has a “fold” line knitted into it. And the ribbing is different. And uses less than 14 yards of sock yarn. Do all those changes make it publishable? As a free pattern? 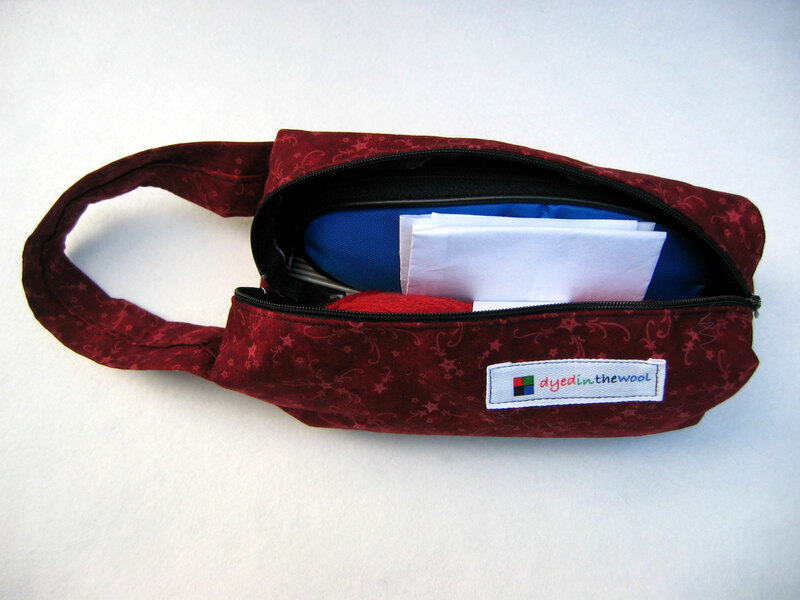 This entry was posted in finished object, knitting, knitting pattern and tagged finished object, Free pattern, knitting by Patti_is_knittinginflashes. Bookmark the permalink. I have my OO in a decanter. A cover would rather handy for that, too. I think your new pattern is enough off of the original to publish as your own. It’s very interesting and different from the original pattern. Oh my goodness….What will you think of next? Is there ANYTHING that can not be made with yarn?????? Make sure you offer that pattern to your friend Pat! Just kidding. You ARE the greatest SisANYONE could ever have. REALLY! Looks GREAT– can hardly wait to try it out! Look for it in your mailbox later this week.